Is it really possible to boil cooking down to balancing just four elements that, when understood, can make anyone a great cook? Well, that’s the premise and purpose behind chef, author and now documentary host Samin Nosrat’s four-part Netflix series, Salt Acid Fat Heat, based on her similarly titled cookbook, Salt, Fat, Acid, Heat: Mastering the Elements of Good Cooking (Simon & Schuster, New York, NY, 2017). After watching the show, I’m pleased to confirm that Samin Nosrat is onto something of consequence for cooks, experienced as well as novices. This documentary-style Netflix series, directed by Caroline Suh and produced by Alex Gibney, is filmed in a similarly rich and artistic format as recent releases like Chef’s Table and Michael Pollan’s Cooked (another Suh/Gibney productions in which Nosrat also makes an appearance) and takes viewers on a globe-trotting journey to explore the nuances of each of Nosrat’s four elements. Through gorgeous aerial shots, intimate kitchen scenes, al fresco grillings, market meanderings and indulgent tastings, we meet masters of each element making dishes and preparations that epitomize and showcase their expression across northern Italy, Japan, Mexico’s Yucatan peninsula and finally, Berkeley, California where Nosrat’s culinary career originally began as a chef at Alice Waters’ seminal local/seasonal-eatery, Chez Panisse. And while Nosrat may focus on the elements of salt, acid, fat and heat in cooking, the tone of the series is decidedly sweet and intimate. If nothing else, the show will leave you with an indelibly playful view of cooking. It’s abundantly clear that, for Nosrat, cooking is a joyous and tactile affair dominated by a sensual interaction with every element. She appears fully in love with the experience of food. 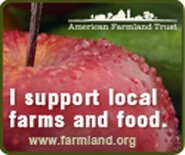 All of it: ingredients, shopping, preparations, cooking, tasting and ultimately sharing it. Her laughter permeates nearly every minute of the four-part show and nary a scene passes without her doubling over, naughtily stealing a bite of something being prepared, oohing and aahing over a new dish or her eyes bulging with the delight of discovery as she utters this is so good in language after language. For her, cooking seems not so much about precise technique but a decidedly organic journey guided more by her well-honed senses and intuition than any recipe. The first episode focuses on fat and introduces viewers to the ways this element carries flavor to food through the lens of Northern Italian cuisine. Here we meet olive farmers, we learn the patience needed for truly flavorful pesto, we meet a butcher of aged heirloom pigs (from whom Nosrat steals an apparently delectable slice of pure fat), we watch Nosrat learn to prepare a traditional Genoese focaccia and a simple egg pasta, and finally see how parmesan is made and aged into its finest, nearly crystalized form. The lessons? Use the right fat for the dish and you’ll be rewarded with rich and sumptuous results. The final scene of the first episode, like the other three, ends with the kind of glorious feast of friends that epitomizes the true spirit of Italian cuisine and the purpose behind it: sharing. Episode two goes to the other side of the world to explore the ways that salt draws out and lifts the flavors of food in Japan, the nation with a stunning 4,000 types of salt. We meet traditional miso and soy sauce producers as well as the makers of a fine kelp-infused salt called moshio and get to see how these simple salt-driven ingredients are all that’s needed to bring out the flavors inherent in fresh sashimi, fish soup and a soft-boiled egg seasoned with miso. One thing that becomes apparent in this episode is that not all salts are created equal. Matching the right size and shape of the salt crystals to the dish is a critical part of balanced cooking in Japan. At the end of the episode, we witness the transformative power of salt as Nosrat shares her recipe for braising short ribs with a soy, miso and ginger marinade and a dashi braising stock (made from seaweed and bonito flakes). The star of the series’ third episode is my own personal favorite of the four elements: acidity. The one that brings mouth-watering balance to heavy dishes and offers brightness for cutting through fat, sweet, starchy or salty dishes. It’s also coincidentally the element most conspicuously lacking in many traditional American dishes. And what better place to see it in action than the citrus-dominated dishes of Mexico’s Yucatan? There, under the tutelage of abuelas and chefs carrying on centuries-old Mayan traditions, Nosrat learns to make pavo escabeche, a traditional turkey and meatball dish where the meat is marinated and cured a lá ceviche in a sour orange juice before being stewed. She also learns how to make a steamed fish in banana leaves dish, tastes a variety of salsas and curtidos made with pickled vegetables, joins a crew of elder tortilla makers, and tastes rare and unusually acidic honeys of different tropical plants from a species of bees without stingers called Meliponia. 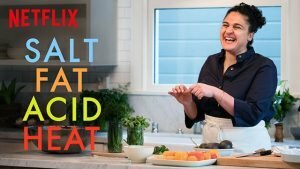 The final episode, Heat, brings viewers full circle — from gathering inspiration in world travels back into the home kitchen where Nosrat shows us how to bring all the elements together in the crucible of the stove, oven and fire which have the power to chemically transform food and release all kinds of additional flavors. After a visit to Chez Panisse where one of her early mentors explains her secrets for cooking steaks on the open flame, Nosrat uses the rest of the episode to share practical cooking tips and make some of her favorite dishes for (and with) friends and family, including some that she says are perfect examples of the balance of the show’s four elements, like a buttermilk-brined roast chicken and a bean, Brussel sprout and carrot salad balanced with tangy feta, olive oil, zatar and cilantro and, of course, salt. Through all these adventures, we see that while Nosrat is clearly an expert ready to teach and share her skills, she’s also still a student and an eager taster, adjusting her own cooking styles and techniques and tweaking her mental cooking math as she encounters new foods and approaches. It’s essentially an adaptive mode that, at its core, is highly artistic and in its rejection of dogma and tradition, somewhat radical. Her easygoing nature, joyful wonder and frequent laughter belie the fact that she is actually pointing viewers towards a rather experimental backdoor to great cooking. And why not? When you really love something, you should share it. And the truth is, once you do know the basics of these four elements and get to know the world of flavors out there, cooking isn’t some kind of mysterious alchemy. It’s a simple science of balance that can be easily adapted to any taste or ingredient and lead to an endless variety of culinary adventures, tasty discoveries and flavorful possibilities. Just learn the basics and follow your taste buds.